Purchase your used vehicle with confidence. For all vehicle inspections and car inspections in Perth. The personal service we provide differs from other inspection companies by conducting day-to-day services on a smaller scale. All of our inspections are derived from a detailed panel & bodywork analysis, and carefully planned by members of our team. We cover areas in both North And South of the river in Perth, covering most metropolitan suburbs. Contact us for more information on our coverage. 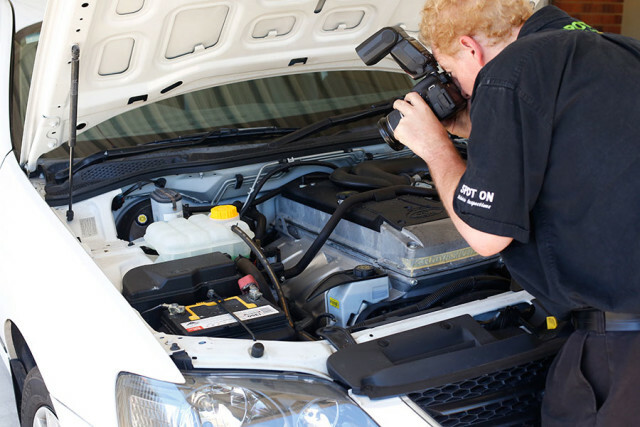 Spot On Vehicle Inspections prides ourselves on our ability to provide highly personalised car inspections in Perth, and our customers value our thorough service and friendly inspectors. 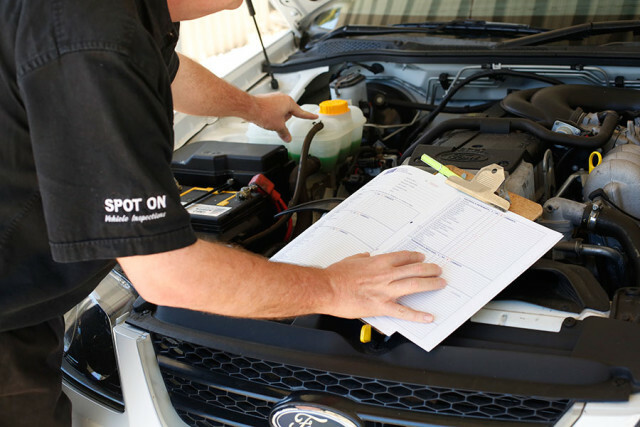 With a fixed-price of only $255 for all our vehicle inspections and car inspections in Perth, the expert technicians at Spot On Vehicle Inspections offer fully comprehensive car inspections to all our customers. 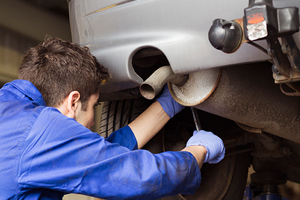 What’s Included in a Vehicle Inspection? We operate both north and south of the river, as well as east to the foothills. In some outlying areas (such as Rockingham and Mandurah), an extra service fee may apply. In every case, we’re committed to ensuring that all of our customers across Perth’s metropolitan area are able to take advantage of our fast, friendly and comprehensive inspection service. Purchase your new or used vehicle with confidence for only $255. Spot On Vehicle Inspections are expert technicians who specialise in extremely thorough pre purchase car inspections, designed to grant you the peace of mind required to purchase that vehicle with confidence. Our car inspection process begins with a review of the paint and body work to determine if any repairs have previously been carried out. This is accomplished with an up-close visual inspection of your car or vehicle by a highly qualified inspector. By the time your pre purchase car inspection is complete, we’ll be able to provide you with a detailed report of your car’s current condition. This is delivered to you in a seven-page document accompanied by a verbal summary of your pre-purchase car inspection. If you’d like to learn more about our inspection process, have a look at the scope of our vehicle inspections page on our website. Our company was founded on the belief that friendly and highly personable service is still possible in today’s fast-paced world. Spot On Vehicle Inspections was founded in 2015, but our managing director has upwards of a quarter of a decade’s experience working on and inspecting cars in Australia. This is the guiding principle behind our service model – and our customers appreciate the difference it makes. If you are in need of a used car inspection in Perth, you won’t find a friendlier service in the metropolitan area. We employ a small team of expert technicians who are committed to working closely with our customers throughout the inspection process. If you’d like to learn more about our service – or are interested in learning more about our inspection process – please don’t hesitate to get in touch with us today. Spot On Vehicle Inspections understands that the only way to consistently provide friendly and reliable service is by getting to know our customers and the vehicles they drive. This goes a long way toward ensuring that the car inspections we conduct are both personal and highly targeted. We’re honestly one of the smaller inspection services in Perth – and we wouldn’t have it any other way. This allows us to bring a finer attention to detail in each of our inspections. We’re well-acquainted with our regular clients, as well as with their preferences and the vehicles they prefer to drive. You won’t find a more personalised inspection service in Perth. Given our highly personalised service model, there’s a good chance that the person you speak to when calling in to schedule your appointment is going to be the same technician that takes the lead on your inspection. Whenever possible, this is the way we prefer to operate. Your technician is going to conduct the inspection on both a visual and auditory basis. In other words, they’ll look at and listen to your vehicle for tell-tale signs of potential problems. This is particularly important for a used car inspection, as many warning signs are not immediately apparent to untrained eyes and ears. But that’s only the beginning of the process. We’ll also hook your vehicle up to a state-of-the-art scanning device that uses the latest technology to verify or elaborate upon any problems that the technician may have encountered during the preliminary part of the inspection. Modern vehicles have an on-board computer that stores what’s known as a ‘fault code’ whenever an internal problem occurs. The scanner will check for fault codes and alert our team to any additional problems. After we’ve detected any potential problems with the vehicle, we’ll follow it up with a test drive. In our experience, no pre-purchase car inspection is complete without spending time behind the wheel and on the road. You can look, listen and scan to your heart’s content, but there are some problems that are only going to manifest when the vehicle is saddled with the strain of performance. After a few kilometres’ drive, we’ll return to the garage and have a look under the bonnet. This gives us a final chance to verify any problems that we know exist whilst confirming those that we suspect. And in the rare event that the previous diagnostics failed to turn anything up, this gives us one final chance to catch them. You won’t find a friendlier, more thorough pre purchase car inspection and vehicle inspection service in Perth. Please don’t hesitate to contact us today if you’d like to learn more about our car inspection process or if you’re ready to schedule an appointment. You can call us on 0407 193 506 or fill out the form on our ‘Contact Us’ page and we’ll get in touch with you directly. Good Morning I had Tom in WA help us out while we looked for a car for our Daughter this last week. The service we got from Tom was brilliant to say the least! He saved us a very costly amount of money with the first one we looked at turned out to be a real lemon! His advice and thorough checks were second to none and we got him back to look at a Toyota Corolla for us, he was so obliging and this one turned out so much better! Thank you Tom your friendliness and excellent knowledge has found us a good, reliable, safe and solid car for Jess! Tom from Spot On Vehicle Inspections did a fantastic job with the inspection of my recently purchased Mazda 6. There are always risks associated with buying a second hand car, but my mind was put at ease after having Tom inspect the car and provide me with his comprehensive report. Tom used all the latest technology, was extremely friendly and very easy to deal with. Some of the gadgets he used were particularly interesting – my favourite had to be the tool that could instantly tell if the paintwork on each panel was original or if it had been replaced/repainted. These types of issues just can’t be identified by the naked eye or by an unsuspecting buyer, and so I am extremely glad I went through the exercise of having the car professionally inspected by Tom. Nice dealing with you yesterday. Thank you for the report and for the excellent service provided! I wanted to express my sincerest thanks for your excellent work in helping me to find a reliable, mechanically sound car. You were exceptionally diligent with communication and you provided excellent service with distinct authenticity which was well and truly noted and appreciated. Thanks for bending over backwards to accommodate any difficulties. Despite it being cliché, I will certainly be putting your name forward to any of my friends looking buying a car, especially from Gumtree where there is so much of a gamble!